Camcorder Video Capture: Camcorder not recognized through USB? • Blu-ray Players - Sony, Samsung with Internet capability. Get NetFlix, YouTube, BD Live and more. Wireless connectivity to your broadband service. Although the author has attempted to impart accurate information, modifications to standard Windows operating systems are inherently risky for the novice user and the author is not responsible for any damage or losses of any kind caused by the use of the following information. If in doubt in any way, consult a computer expert professional before executing any instructions below. Many people have bought Digital Camcorders in years past including Mini-DV tape based camcorders which were very popular in 2003-2005. Sony was a major player in the camcorder market in these years. A typical camcorder Sony offered in 2004 was the DCR-TRV22 model Handycam which was later replaced by newer MiniDV models and eventually by DVD, hard-disk and flash memory camcorders. In 2004 and 2005, if you were the typical Sony camcorder buyer, you bought your Mini-DV tapes and recorded your videos, played them back on your TV set using the supplied audio/video cables and all was well. Sony even supplied software which allowed you to capture your video from camcorder to your PC. 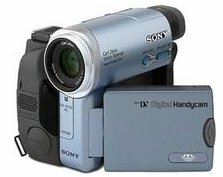 Sony supplied a CD-ROM with the camcorder which contained the ImageMixer program to capture video from camcorder to computer using a USB 2.0 cable connection. The Firewire cable connection was also offered but often ignored because the consumer had to buy a Firewire cable and may not have had a Firewire interface card installed in their desktop PC or laptop at that time. Microsoft Windows XP operating system was the current OS running on Windows computers when these Sony MiniDV camcorders arrived. Microsoft has many priorities when it comes to software and even supplies extra utility programs for many tasks users may want, however, Microsoft cannot possibly include software for every manufacturers external device and make compatible over every release of new operating system for personal computers. The responsibility lies with the device's manufacturer to provide software to allow their device to work successfully with your computer's operating system software. Sony unfortunately did not update their software when Vista arrived. Sony probably expected you to buy a new camcorder with new drivers and new video capture software. Picture Motion Browser was Sony's replacement for the old ImageMixer package. Video capture from camcorder to computer involves many details. If one piece of the complex process fails, you may not be able to reach your goal. As technology changes over time there are incompatibilities which crop up to create confusion and frustration for consumers. This is exactly what happened for many a Sony Handycam user. As has happened over time, new computers are sold with current operating software and as consumers bought new PCs they got Microsoft's newer software. Enter Windows Vista and Windows 7 to replace Windows XP. Those who were using USB 2.0 to transfer video from camera to computer soon discovered there was a problem under Windows Vista. Error messages informed the user running Vista that the camcorder was unrecognized. A search for a driver was performed but still no communication between computer and camcorder. Frustration, even anger overtook the consumer. How can this be possible? Should not the process just work? It worked under WinXP. Yes it worked under WinXP because everything was compatible. In particular the Sony driver software for the camcorder. Under Windows Vista, Sony's WinXP driver software is confused. A driver is the software which allows higher level software such as Vista to interact with a hardware device such as a camcorder. 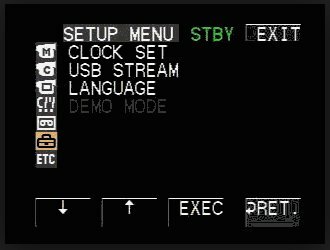 The driver issues hardware specific commands to the device. Drivers are also operating system specific. Interrupts have to be issued and timing must be coordinated. Windows runs the computer and the driver runs the camcorder but both have to talk to each other. Many users want to capture video on their laptop. For those with a laptop and a Firewire port, you are indeed saved from the tasks below. Using Firewire on a desktop or laptop with Vista usually just works. Sony camcorders from 2004 typically had a Firewire port. So buy a Firewire cable, usually 4-pin to 4-pin, a laptop with Firewire (see HP Elitebook 8560p), hookup the camcorder to the computer with Firewire cable and it is recognized by Vista. It is interesting to note that the Memory Stick in the Sony Mini-DV camcorders will indeed allow you to transfer still images to your VISTA computer using the USB 2.0 cable connection. This video shows how to capture video on a laptop with VISTA and Firewire port from Sony MiniDV tape camcorder. This may work for those with a Firewire interface on their computer but what about all of us without Firewire. We bought our computer already and it does not have Firewire. Sure you can go back to WinXP on your old computer but you want to use that new laptop and VISTA or Windows 7. Well there is much confusion about the solution to this issue. At first it seems that there is no solution, nothing seems to work. You connect the camcorder to the computer using Vista with your USB 2.0 cable and it just will not work. As it turns out there just might be a solution after all but it requires a lot of patience and work. Basically you have to go to the Sony website that supports their products and download the original driver for your camcorder. That's right, the old WinXP driver from years ago. The key to this whole solution is called COMPATIBILITY MODE. When done correctly, this allows the Sony WinXP driver to run under VISTA as if it were running under WinXP. When it does, voila, your camcorder is recognized and your video will transfer to the computer using USB 2.0 cable connection. There are several steps however to make it all work. 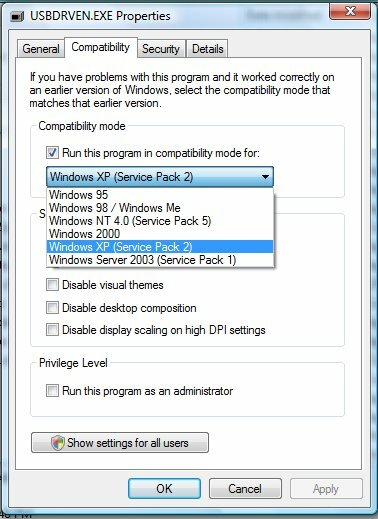 First and foremost, your computer must have Service Pack 2 for Vista (SP2) from Microsoft. You can download SP2 for Vista for free from Microsoft. Follow the instructions and install service pack 2 for VISTA. This will take a while as it installs and reboots. NEXT, download the original Sony driver for your camcorder from the Windows XP days. NEXT, right click on the .EXE file and go to PROPERTIES. Click on the Compatibility Tab. Select Windows XP and APPLY. Now double click on the .EXE file to install the driver. Follow the instructions and hopefully the driver will install. You should get a message to the effect that the driver was installed successfully. When you plug the USB 2.0 cable into the computer and power on the camcorder, VISTA gets the Sony driver and is ready for use. 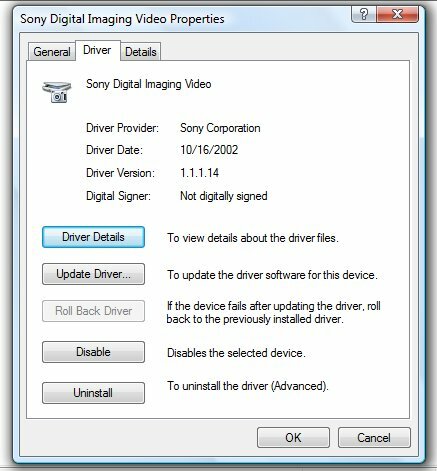 If you look in Vista's DEVICE MANAGER now, SONY DIGITAL IMAGING VIDEO appears under IMAGING DEVICES and you can view the details of the driver. Each time you connect with USB 2.0 and power on camcorder, the driver is added and should be ready for use. Download and install. You can now capture your video from the camcorder tapes using your USB 2.0 connection IN WINDOWS VISTA. On your camcorder make sure you have USB Streaming mode set to ON. 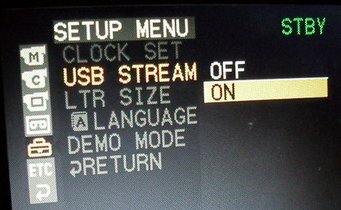 Plug in USB cable to computer and switch camcorder ON in VCR mode. Windows should install the driver. Run your video capture program, play camcorder recording and record on the computer. A file will be created of your video (and audio) on the computer. Once in the computer, you can copy the video to a flash drive, burn a DVD, upload to the internet and more. There are video file conversion programs that will copy your video to another file format if needed. The standard file formats will play in Windows Media Player. Learn more about video file formats.